Is It Timeless or Trendy? ASKING YOURSELF THREE SIMPLE QUESTIONS WILL HELP YOU DECIDE. It’s easy to spot trends -- you see them in magazines, in social media posts, in stores, and all over HGTV. What’s harder is determining which of those trends will stand the test of time, and which will be a flash in the pan. Here are a couple of tips to help you decide whether something is timeless or trendy, and whether or not that particular trend is for you. 1. Is it functional. Nothing can be timeless if it does not serve you functionally over the course of time. Examples: Marble countertops are gorgeous, but if you’re a gourmet cook, the acids in your ingredients will eat right through the material over time. 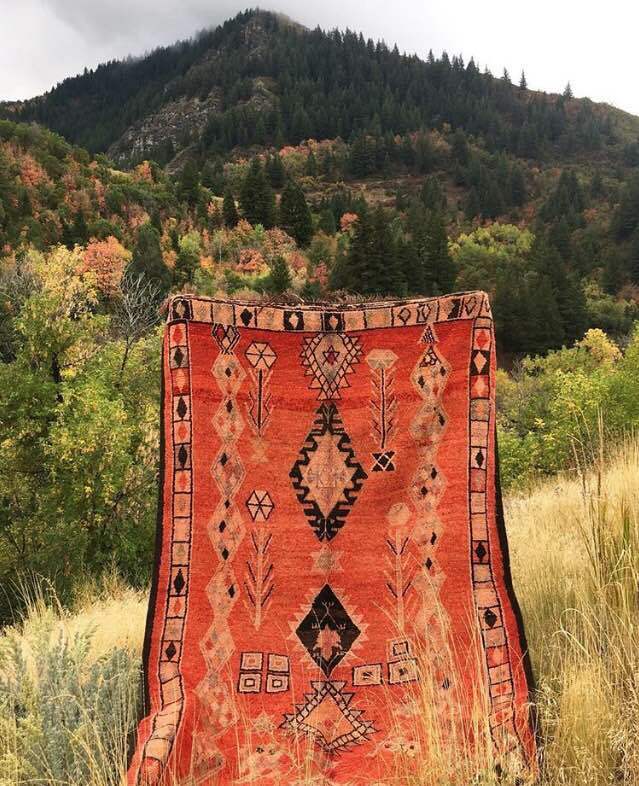 Love the boho look of Boujad rugs? Me, too, but my two dogs tore mine up in a matter of a few weeks. If it doesn’t last, it’s not timeless – literally! 2. Is it adaptable. If your trend meets your functional needs, the next question to ask yourself is if it can evolve with your style. White walls are a huge trend in the design world right now. Do white walls work in a multitude of aesthetic environments? Yes! You may get sick of that avocado green sofa (trendy), but white walls allow for versatility. 3. The last thing to consider is simplicity. Typically, the simpler the design, the more likely it is to remain timeless. Think about subway tiles. Yes, they may be a little predictable, but they’ve stood the test of time because a) they’re functional b) they’re adaptable and yes, c) they’re simple! Now, I’m not trying to rain on your trend parade (or my friend who asked the question). I love incorporating trends into the spaces I design. However, I try to do so 1) sparingly and 2) inexpensively. Love the rose gold finishes that seem to be everywhere (as seen above)? Rather than installing a new kitchen faucet and fixtures, incorporate the trend in accessories – a teapot, a fruit bowl etc. Décor is also a great place to apply the latest design ideas! Digging the Justina Blakeney jewel toned sofa look? Me, too, but before committing the bucks, try a few throw pillows in the same vibrant hue and see if it satisfies. My last bit of advice is this: ask yourself the hard question: Would I still love it if it wasn’t trendy? What trends are you dying to try? Cargo bill itself as “a journey of spirit, time, and place.” When you walk into their gigantic historic warehouse, you’ll see why. All corners of Cargo are filled with everything from Japanese tansus to Indian quilts to teapots and everything in between. If you leave this place empty-handed – or uninspired – there’s something wrong with you. Founded in 2005, Canoe features simple, functional and beautiful home goods made with natural materials. Think glass-and-wood; textiles and ceramics all of which make great gifts for friends or self. Hive’s motto is "Good design can and should be presented in an inspired, knowledgeable and friendly manner." Through the company’s website and in its northwest Portland store, Hive sells the iconic modern brands Alessi, B&B Italia, Herman Miller, Knoll, and Vitra in a museum like atmosphere. Schoolhouse Electric was founded by Brian Faherty in 2003 following his discovery of a long-lost collection of cast-iron glass shade molds in an abandoned warehouse and carefully restoring them back into production. Today, he’s now operating out of a gigantic facility in the industrial district selling all manner of furniture, lighting, bedding and hardware. Locally owned City Home has two showrooms that specialize in midcentury modern to reclaimed and steampunk. They also carry designer home decor and furniture lines, including Magnolia Home Furniture Collection, Joybird and Justina Blakeney Home. For fans of Asian goods, Asia America is worth a stop. They boast a nicely curated collection of art, antiques and furniture from over 40 years of travel to every corner of Asia. Between their SE warehouse and their waterfront showroom, they have more than 5000 pieces to ogle. 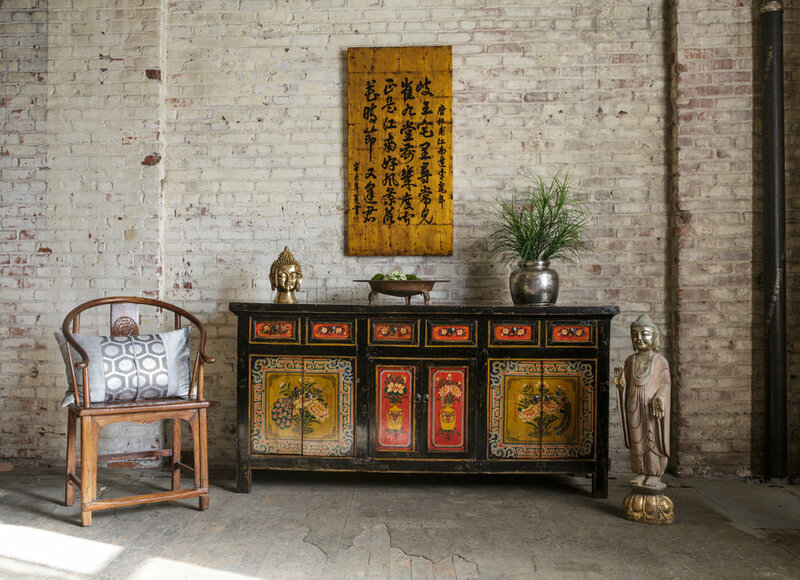 Asia America in SE Portland carries rustic furniture and antiques. This 20,000 square foot industrial loft is a midcentury modern design lover’s dream. They specialize in restoration and custom design and upholstery work. You can get a taste of the kinds of amazing pieces they bring in by visiting their website, but their store is not to be missed. This is exactly a home décor store, but Solabee is an oasis for plant and flower fiends. A women-owned full-service floral studio and plant shop provides fresh and unique botanical treasures. And their super knowledgeable staff at their conservatory-like shop will assist you in selecting the perfect plant for your space. Solabee Flowers in heaven on earth for plant lovers. Photo by Urban Nest Realty. Legacy Modern is your one stop shop for mid century modern, industrial, Americana and Mission Arts and Crafts home furnishings. Owner Mike Albino hails from a fourth generation of furniture traders. If he doesn’t carry it, he’ll find it for you. They’ve also carry the works of many local artists and fabricators, as well the furniture line, Gus Modern. Seams to Fit Home is an upscale consignment furniture designer showroom offering a modern mix of furnishings and home decor for urban living, located in Northwest Portland. This is the place to hit for beautiful, very lightly used custom pieces. Not Portland, but absolutely worth the drive. Rose City Modern specializes in quality mid century modern furniture and housewares. Following these guys on Instagram is like getting a lesson in midcentury design and their store is the same way. If you’re a midcentury fan, make the trek to nearby Beaverton and pop in to this unassuming little shop. What did I miss? Let me know in your comments below!